Can rich countries meaningfully help developing countries improve their standards of living? Throughout history, developed nations have consistently and ruthlessly exploited poorer countries. Due to the pillaging of natural resources by the colonial empires of Europe in the 19th century, and the abduction of people for the Western slave trade, it is undeniable that today’s rich nations are a major cause of poverty and instability in developing countries. Hence it is clear that rich countries have a responsibility to help improve living standards in these areas. This has been attempted in key two ways: foreign aid projects funded by NGOs and governments, and foreign direct investment by TNCs in developing nations. 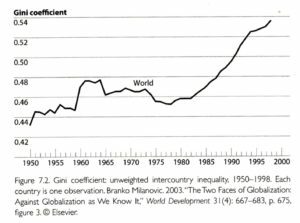 However many argue that the economic growth produced by these methods has only served to perpetuate inequality, further reduce their natural resources and create unstable societies dependant on aid to survive. Therefore the question arises: is it possible for MEDCs to help developing nations or is aid and globalisation merely a thin veil to allow the rich to benefit from the struggles of the poor? Foreign aid is the most direct way a government can attempt to stimulate development in LEDCs. However, governments and charities are constantly criticized by the media for the way in which they deliver aid. For example, in December 2016, the Times claimed that the Department for International Development rushed to dump £9 billion in an ‘attempt to meet the country’s controversial annual target’. The money went into 219 World Bank aid funds, which have been criticized for their lack of transparency and for not holding donations in their funds without spending them. This demonstrates how government aid is often spent without much thought. Corruption is rife throughout the developing nations that need aid the most, as can be seen in Figure 1, consequently, excessive amounts of foreign aid is lost through corruption. In Nigeria James Ibori – a governor – embezzled 250 million USD that was meant to be spent on providing education for 400,000 children. This is far from an isolated scenario, as Ban Ki-moon, speaking at a UN panel on Accountability, Transparency and Sustainable Development, claimed that “corruption prevented 30 per cent of all development assistance from reaching its final destination” in 2012. However, inefficiencies and scandals are far from the biggest problem with foreign aid. Its critics argue that many third world nations have become dependant on foreign aid and hence the improving living standards created by aid are unsustainable. For example, 16% of the Ethiopian population in 2000 was reliant on food aid due to persistent drought and famine. The head of the District Agricultural Office in Ethiopia claimed that “due to the availability of food aid farmers have developed a dependency syndrome and have become reluctant to improve their lives”. This shows how aid can disincentivise societies to work and improve their own standards of living. On the other hand, well-chosen projects funded by charities and governments have created sustainable long-term growth. These projects involve educating and training the population of developing countries in fields such as medicine, engineering and teaching or building infrastructure such as railways and power plants to stimulate and facilitate economic growth. For example, in India, foreign aid has been heavily focused on improving education and this has resulted in literacy rates being 6 times greater now than when India declared independence in 1947. This has been a significant factor in reducing poverty in India, which halved from 1993 to 2011, as it has empowered more people to be able to access better jobs. A more contentious form of foreign aid in times of economic crisis has been provided by conditional loans from supranational organisations like the IMF and the World Bank. These loans are given to nations with the requirement that the recipients will take steps to become more fiscally responsible and more free market. They are required to meet targets for reducing the size of their state through privatisation and spending cuts. The IMF argues that through encouraging better fiscal and monetary policy and the deregulation of markets, they help ‘countries solve balance of payments problems without resorting to measures that are harmful to national or international prosperity’ and therefore they facilitate long-term growth. However, opponents of this form of neoliberalism claim the spending cuts directly result in decreased standards of living in these nations. Conditional foreign aid and sanctions, involving restrictions on international trade of certain luxury goods and military equipment, have also been used to improve human rights laws in developing nations through several western governments refusing to give aid and lend to countries with appalling human rights record. This has created an incentive for developing nations to improve human rights legislation. However, it is dubious as to whether sanctions are successful in improving human rights, with only 33 out of the 83 cases of economic sanctions in the 20th century being successful. This is because those in power are usually sheltered from the effects of the sanctions, whilst the public bare the cost. Although foreign aid’s primary purpose is usually to benefit the recipients, large aid donors have come under fire for using aid as a political tool in order buy votes in supranational organisations such as the UN. For example, after Yemen voted against a Security Council resolution demanding that Iraq pull out of Kuwait in 1990, the Secretary of state at the time wrote to Yemen’s ambassador threatening “That is the most expensive vote you have ever cast”. Soon after the US entirely scrapped its 70million USD a year aid program in Yemen, sending a message to all countries benefiting from USAID: agree with us or else. This practice hasn’t stopped in recent years, with Donald Trump threatening to cut aid to nations that voted against the US on a United Nations General Assembly vote condemning Trump’s decision to move the US embassy to Jerusalem. These actions suggest that foreign aid, particularly from the USA, is merely a tool used by rich countries to undermine the democratic process of supranational organisations like the UN. The private sector investment has contributed a significant amount to economic growth in developing countries. Trans-national Corporations have been outsourcing to developing nations because of the plentiful supply of cheap labour and the purposeful lack of regulation in order to attract FDI. Foreign direct investment has undoubtedly created secondary sector employment in LEDCs. However many argue that these jobs have done little to raise standards of living in developing nations due to the low pay and poor working conditions that would be illegal in rich countries. LEDCs also tend to have little environmental regulation, which is also poorly enforced due to corruption. This has led to devastating health consequences in the long run; China’s Ministry of Health declared that industrial pollution has made cancer their main cause of death. Bangladesh is a hub for sweatshops and now has over 4500 garment factories, producing clothing for western brands like Nike and Primark. Whilst TNCs use of these sweatshops and the benefit they receive from the suffering of their workers is immoral, there have undoubtedly been benefits. Although the sweatshop workers are often paid as little as $2 a day this is still above Bangladesh’s and the World Bank’s extreme poverty line; the growth of the manufacturing sector in Bangladesh has contributed to the halving of the extreme poverty rate from 34.8% in 2000 to 14.8% in 2016. This injection into Bangladesh’s economy has, through the multiplier effect, significantly increased consumption and has subsequently allowed local small businesses to flourish. These sweatshops have also contributed to fighting social stigmas and gender inequality; over 80% of the workers in the garment factories are women, many of whom are the sole earner in their families. 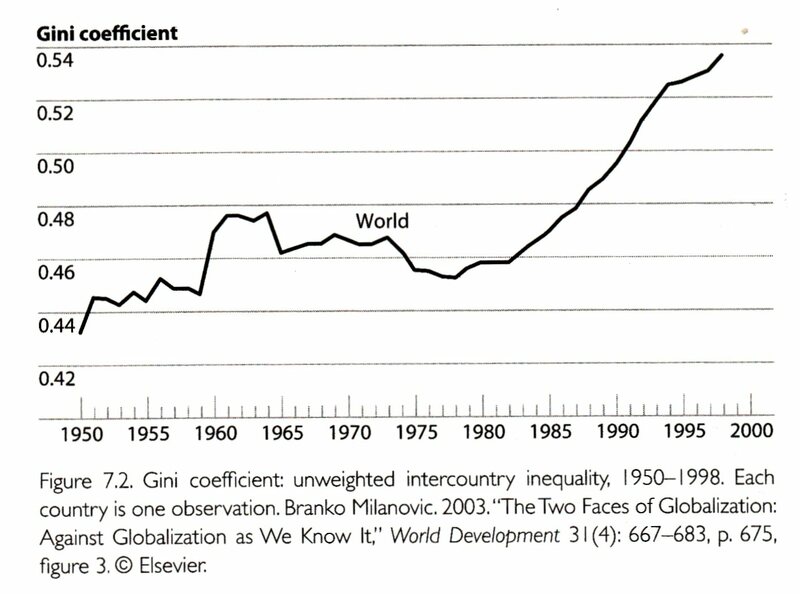 However, it is undeniable that this manifestation of globalisation has increased global inequality (as can be seen by the increase in the Gini coefficient in Figure 2); a report by Oxfam found that in 2017 “eight men own the same wealth as the 3.6 billion people who make up the poorest half of humanity”. All of these own stakes in global firms, which have profited from outsourcing to developing nations. The most well know beneficiary of FDI and the resultant export-led growth is China. They have used aid and the initial growth produced by TNCs outsourcing low skilled labour there to invest in education and infrastructure. China’s investment in human capital has allowed it to slowly shift employment from primary and secondary jobs to better-paid tertiary sector employment. China’s service sector has grown from a quarter of the workforce in 1990 to 49% in 2017 and they have brought over 800 million people out of poverty since the start of their economic reform. This transformation in the composition of their workforce has allowed China to introduce strict regulation concerning pollution without having to worry about the effects of manufacturing moving abroad. However, it is questionable how much of China’s success is because of western assistance. China is unique in the extent of progress it has made, despite a plethora of other nations receiving the same or more foreign aid and investment. This is due to its authoritarian regime, which, because it is not shackled by the weak ineffective attempts at democracy that have plagued other developing nations, is extremely rapid in making changes and in building infrastructure. This has come at the cost of human rights violations and censorship. Foreign aid from rich countries can help improve standards of living in developing nations, however, there should be a greater focus on how the aid is spent rather than how much spent. Moreover, it is unlikely that aid by itself can create long-term prosperity, as it is inefficient and because a country that is over-reliant on aid can not only suffer from a lack of incentive to work and innovate but also open itself up to political extortion. Although foreign direct investment and trade have perpetuated global inequality, it can lead to long-term sustainable growth if developing countries effectively reinvest the extra tax revenue into education and infrastructure in order to improve quality of life. MEDCs should be wary of using economic sanctions to improve living standards, as they are more likely to worsen the situation than improve it. In conclusion, whilst rich countries can and should meaningfully help developing countries improve their standard of living, developing nation’s governments play a significant role in determining whether this assistance is beneficial in the long run. To see more about the essay competition, please click here.